There are so many pulled work stitches that I was in more danger of running out of patience than of running out of stitches. 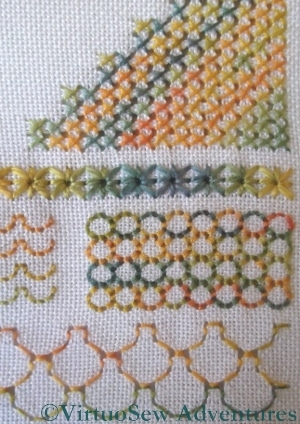 Star Stitches in the heavier thread create a strong horizontal divider, with the colour change rippling across the fabric. Then I worked two pulled work stitches each at two different scales. One of the patterns creates something a little like festooned curtains, another creates the effect of a tiled roof. Although I worked this many years ago, this playing with scale is something that, when I was doing the Tudor and Stuart Goldwork Masterclass, I came to realise was a very important element of stitch choice and effect. 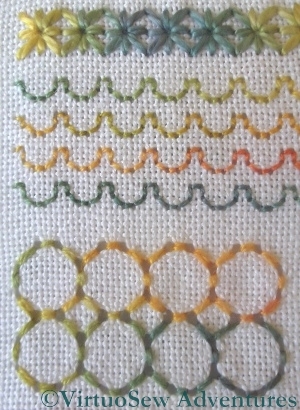 Again the heavier thread made a good divider, this time a dagged edge straight out of medieval heraldry, and then Wave Stitch ( the right- hand picture – possibly not pulled tightly enough!) and a brick pattern follow on. 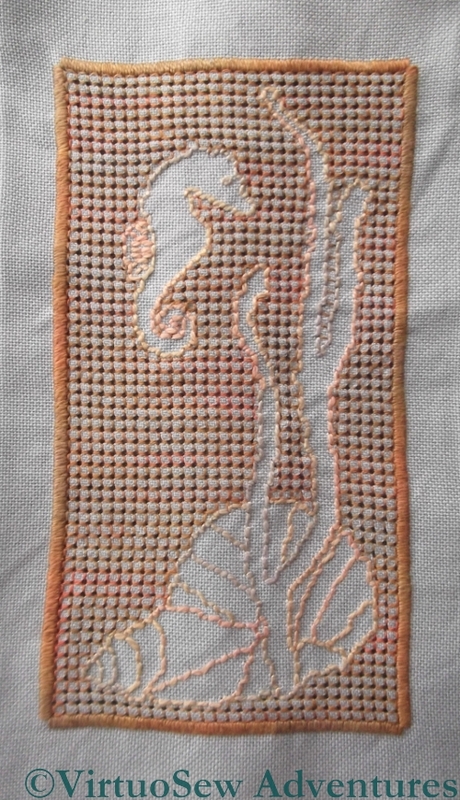 I still cannot recall what I had in mind when I started this piece, except, perhaps, that I wanted to use the citrus-coloured thread for something. 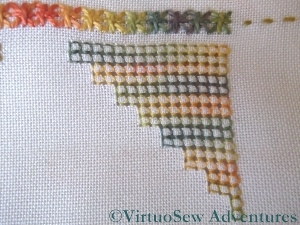 I think that if I were to start this again, I would work a narrower sampler and start by working the pulled stitches in a fine self-coloured thread. 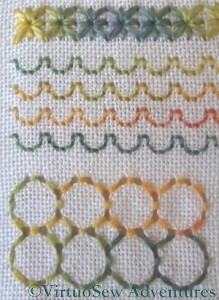 It seems to me now tht the pattern of spaces might be more interesting, in fact, than the stitches themselves. All my regular readers will know that while I’m very keen on experimenting with techniques that are new to me, I’m not so good at finishing what I’ve started. I found this panel when I opened a box in the office that I’ve been ignoring for a while. I can’t even remember how long ago I started it, and you can see that although I worked it on a frame, it’s got somewhat out of shape while it’s been rolled up, because of the varying tension up and down the length of it. There’s less variation across the width, which strikes me as strange since I’m sure I used a roller frame, and didn’t tension the weftwise direction! 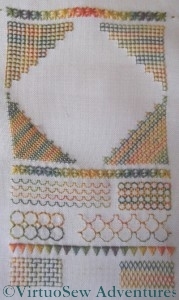 The sampler is worked using another pair of Caron Collection threads, the fine Wildflowers, and heavier Watercolours, in a bright orange and green overdye. 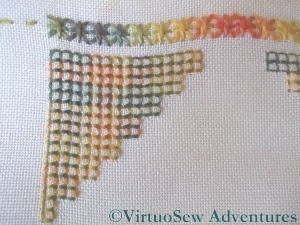 I love the texture and colours of these threads, and they highlight the stitches beautifully. The fabric itself is Jobelan, which is a regular even-weave fabric, perhaps not quite sufficiently widely-sett for pulled work to show to its best advantage. It occurs to me as I look at the photos that pulled work can be done with two different effects in mind – one using the pattern of stitches to create the effect, and the other using a much finer, self-coloured thread, creating the effect with the pattern of holes left by pulling the fabric threads together. Something else to try! Pulled Work Detail 2 – Four Sided Stitch Again? 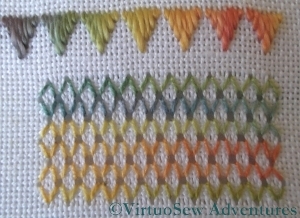 After beginning with a row of Star Stitches in the heavier thread, the first corner of the square panel is in Four Sided Stitch. What puzzles me about this is that the second section seems to be in the same stitch, whereas the two lower corners differ. 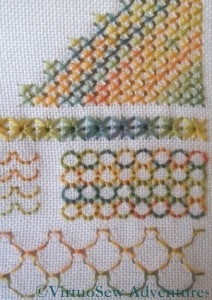 It seems to me that this was a genuine sampler – I was making it up as I went along! I’m really not at all sure what to do with this. It’s an abandoned experiment that I recently rediscovered, and which is nagging me more than somewhat! I really should finish it, or do something with it. It was originally intended to be a traycloth, and I’ve also run out of the thread I was using to hem the piece. So, since I can’t remember what that was I have some unpicking to look forward to, whatever I decide to do with it. 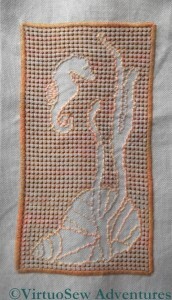 I wanted to play with the idea of stitching the background, rather than the design. I also wanted to take advantage of the fact that Caron Collection colourways are dyed onto different threads (in this case, a fairly fine single-strand thread, and the heavy three-stranded type). As it stands, I’m not happy with it. 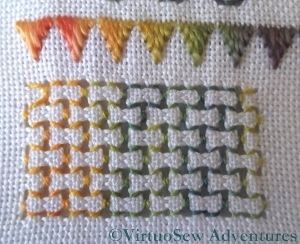 Maybe I chose to make the pulled work too large (it goes over four stitches in each direction), maybe it is too dark. Maybe I just haven’t done enough stitching yet? I still think that doing most of the stitching in the background – a little like Assisi work – would be an interesting variation. Back to the drawing-board!